This blog post showcases so many things dear to my heart... Cupcakes, Starbucks, A Colorful Dress & Louis Vuttion! 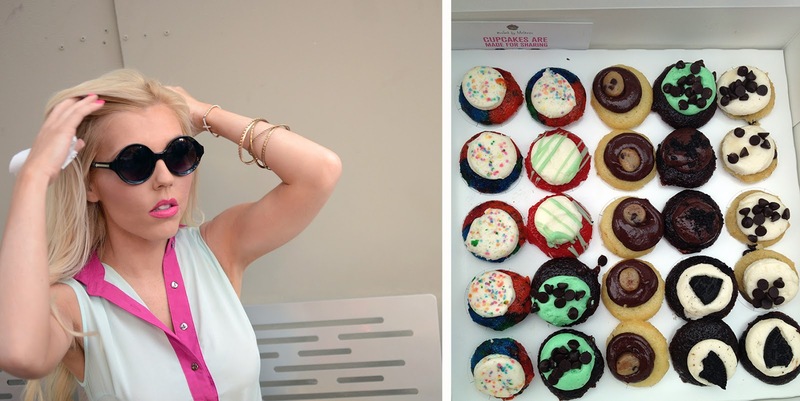 Let's start with the most important, Baked by Melissa Cupcakes! These have got to be the best darn cupcakes ever made! These bite sized pieces of heaven have changed my life for the better! I have hated cake and cupcakes sine I was a child. My mom would always get me a birthday cake so that I could blow out the candles but afterwards I would sit there in disgust as everyone enjoyed the "yucky" dessert. Ever since trying a Baked by Melissa Mini Cupcake in 2010 I have become a Cupcake Addict. I must admit, I am a bit of a Starbucks Addict as well. What can I say, the Very Berry Hibiscus Refresher is amazing! That is my go to drink in the summertime. And I love how my drink actually matches my outfit! My colorblock dress and circle sunglasses are from www.ImHaute.com. My classic white pumps are by Qupid and I have had them at least 4 years. I should probably get a new pair of white pumps but these ones are so comfortable that I can't part with them. My purse is the Mini Alma by Louis Vuitton from their 2013 Valentine's Collection. The color is called Rose Indien which is a pretty dark moroon-pink color. I like that it came with a long strap so that I can carry it on my shoulder or wear it as a cross-body bag. Colorblock A-line Dress from ImHaute.com, Circle Sunglasses from ImHaute.com, Alma BB Bag from Louis Vuitton, White Peep toe Pumps from Qupid. Your style is as sweet as a cupcake, and you are certainly sweet here. Lovely dress with a fun pair of heels. Lovely hair as well.